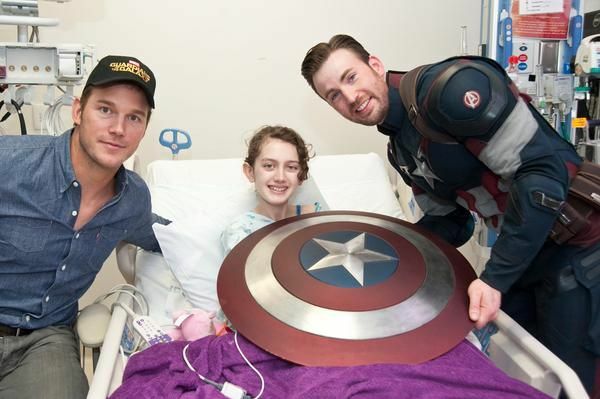 The two superhero Chrises — Pratt and Evans — made a Super Bowl bet in which the loser would visit a children’s hospital of the winner’s choice in costume. As you might know, Chris Pratt lost and visited Christopher’s Haven in Boston with a bunch of Patriots memorabilia last month. But it turns out that Evans is a great sport: Despite winning the bet, he donned his Captain America gear and stopped by Seattle Children’s Hospital on Saturday (Pratt accompanied him in normal clothes). Basically, everybody wins! Captain America saves the day.